I thought it was a brilliant idea, especially since I am a visual person, but I could not draw the wheel that I knew I needed so I got my talented son on the case. Not only does he understand the use of colour because he is an artist, but he also understands depression because he has lived with it all his life. (Interesting how depressive illnesses get passed on down the generations - four generations in my case). On top of all that, my son also knows me very well. 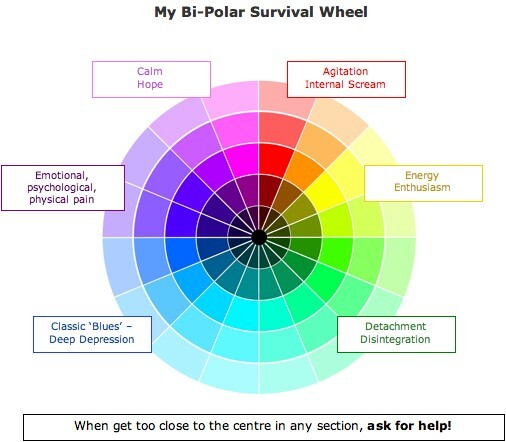 And so he came up with this colour wheel which I have entitled my Bi-Polar Survival Wheel - a little dramatic perhaps but it does hit the truth. I have added the areas that match my experience, in the coloured areas that match how they feel to me. This wheel works very well for me because it doesn't over simplify everything in black and white terms. What it says very clearly is that I must be vigilant and not let myself get too close to the darkest inner wheels: I must seek help before I reach the black hole. This is true for which ever area of the wheel I feel I am in. I use a little piece of blue tack which I move around the wheel on a daily basis (or more frequently if I feel the fluctuating need for it) and it helps me to 'paint' my state of being, to express it without words. As much as I love language and writing, this is somehow very restful. If you (or someone you know) would like to use this wheel in your own blog, your website, or whatever else, please feel free to use it - I have attached it as a JPG file for you. All I ask is that you acknowledge where you got it from. Doing wheelies can indeed be great fun! Thank you JC and thank you my darling son. Submitted by Gabrielle on 30 March, 2008 - 00:37. For him, the very best place to be is half-way between the centre (where everything is unbearably dark) and the outside layers (where life loses all flavour, and everything becomes unbearably bland and wishy-washy). The brightest coloured third wheel in from the outside is his place of well-being. My son's depression is uni-polar so his way to use the Wheel may suit other people with uni-polar depression better. For me, the very best place to be is on the most outside wheel where I feel the richness of my life and my soul: it is my place of well-being. I am aware it may be necessary for me to explain what I mean. Pain is OK when your back is hurting to draw your attention to the fact that you need to shift your position because you have been sitting badly. Sadness is OK when you feel compassion for the suffering of another human being. Detachment is OK when you feel wonderfully untouched by the minutia or the stress of our daily modern life. Energy is OK when it feeds your ability to enjoy life and take action without burning you out. Agitation is OK when it manifests as enthusiasm and the great buzz you feel when you can't wait to see somebody or do something you love. Calm and hope are OK when they are restorative and positive, as opposed to paralysing and painfully yearning. For me the brightest coloured part of the Wheel (the third wheel in from the outside) is dangerous because this is where I burn myself out. Being bi-polar may be why I experience and use the Wheel in that way.